This year being the 100th anniversary of the sinking of the Titanic, it seems that there are a plethora of books coming out on the topic. 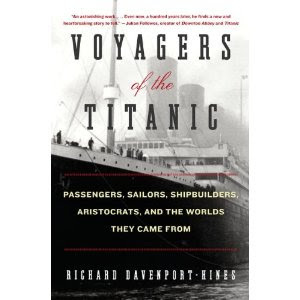 One such book that I accepted for review was Voyagers of the Titanic : Passengers, Sailors, Shipbuilders, Aristocrats, and the Worlds They Came From. The last book I read about this legendary ship was Titanic's Last Secrets (linked to my review) which I LOVED. Sometimes you have to wonder how many angles books can cover when talking about any given subject but everyone has their own perspective! In Voyagers of the Titanic , Davenport-Hines decided to take a look at the people on board. Part II takes a look at the individual class groupings. In one chapter he tells you about the people in first class, the next chapter reveals information about the people in second class, then third class. He also tells you about the officers and crew so that you will better know who was on this fatal voyage and what did or might have motivated them to take this journey across the Atlantic ocean. Part III then focuses on the "meat" of the story - the sinking of the Titanic and the aftermath. This was the most interesting part of the book to me - despite the fact that I've heard the detailed accounts before. There is something about the way everything went awry that completely fascinates me. There are so many spiritual parallels there (e.g., not addressing tiny sin when it crops up, allowing it to grow bigger.) Then, as many have said before, the ship defied imagination. There was something grandiose about it that continues to fill us with a sense of awe. I think that sense of awe and wonder makes us to want to know more about the ship and what happened to it. That does sound emotionally powerful - which is not necessarily a bad thing. But it's one sentence among a thousand such sentences. These descriptive sentences are strung together with such frequency that reading the book began to make me feel like I was reading one gigantic run-on sentence. Ultimately, it caused me to skim Part I of the book, in an attempt to glean fact from the narrative. This "problem" with Davenport-Hines' writing style did not bother me very much at all in Part III because the scene of the sinking of the Titanic is so emotional and overpowering anyway, that excessive words seem almost necessary. In Part II, where in the author discussed the people on board, the flowery language was a bit problematic because it carried the author away into guessing what might have brought any number of individuals on board the Titanic. He assumed attitudes of passengers, as well as feelings and desires. He "surmised" and suggested what type of reactions and emotions people would had to the menu on the ship, interactions with fellow passengers, and how some might have felt about the differences between first class and third class travelers. I do know that some of the information he presented about particular people or experiences is factual. (Clearly it is!) However, he seemed to have strung together some assumptions to fill out the story and that did get under my skin. In short, I'm glad to have read it and I have no problems at all recommending it to anyone who is interested to learn more about the Titanic and it's brief, tragic history. I very much appreciate William Morrow's willingness to send a copy of this book for my review in exchange for my honest opinions. Apparently publishers have been holding onto Titanic books for this year! Cathy Gohlke told me that Promise Me This (fiction) was ready for publication 1.5 years ago. I do think I want to dive into Titanic's history a bit more. Thanks for the book recommendations. I had noticed a lot more mention of the Titanic recently but hadn't realized this was its 100th anniversary. That explains it! There is a Titanic attraction about an hour from here that I've wondered about. At first it seemed kind of morbid, but if it is a replica of the ship (I haven't really checked it out to see), it might be interesting. With all the publicity for the 100th anniversary, I've been really curious about it lately. I think I may try to find the other book you mentioned. I have a Christian romance fiction book set on the Titanic to review. I guess everyone is jumping on the Titanic anniversary. The explorer who found the Titanic is affiliated with a research aquarium in CT that we visit occasionally. They are currently renovating one of their exhibits (they have sort of a history/research type exhibit space as well) to highlight his discovery of the Titanic. We may go visit just to see the exhibit (like everyone else in N.E.). Ive been wanting to read a good book about the Titanic what with the 100th anniversary coming up! Thanks for the review. I completely agree with you on the use of "purple prose" by self-indulgent authors. The language should not get in the way of the story. I'm also with you on the tendency to try to get into the heads of historical people. What's wrong with simply telling the story, and letting the (presumably intelligent and human) reader fill in the blanks? On the flip side, it should have been easy and obvious to determine who survived. That information is important! I guess the summary is this: Tell the reader the story. The reader does not care about you, the author, so stop intruding. I enjoyed reading this review. There are both similarities and differences between them. For example, one is more thematic while the other is more of a narrative.